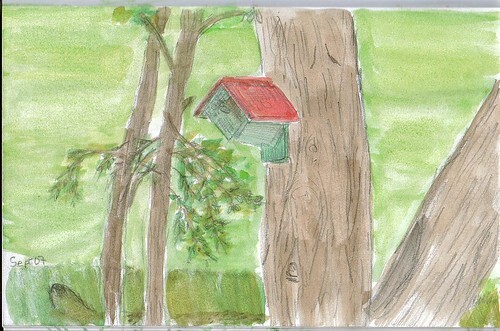 birdhouse, originally uploaded by gitsul. I picked up Phil Lesh's Searching for the Sound at a local dollar store a couple of weeks back. I started reading it the other night and finished it today. I found it interesting and fun to read. I haven't read too many biographies lately, because I found myself feeling let down afterward. I was reading about people who I had admired before to only feel let down after. They turned out to be depressing, not so special people after all. Lesh's book can feel depressing at times, but it doesn't feel like a biography. It feels like you're sitting with him and he's telling you a story. His story, yes. But, his story about the Dead. It was well worth my greenback. It brings back memories of the one and only time I've seen the dead and I didn't even go to the concert because of them. I went to see Dylan and discovered the Dead. I guess you could say I was a late bloomer. I was eighteen, and they were twenty-one. I've gotten older, they've gotten older, and I've gotten to know them a lot better.